The excitement of the Super Bowl only comes around once a year, but there’s a place in Canton, Ohio where you can be surrounded by champions of the football world for the day and genuinely score a touchdown with the friends and family members you might take with you. 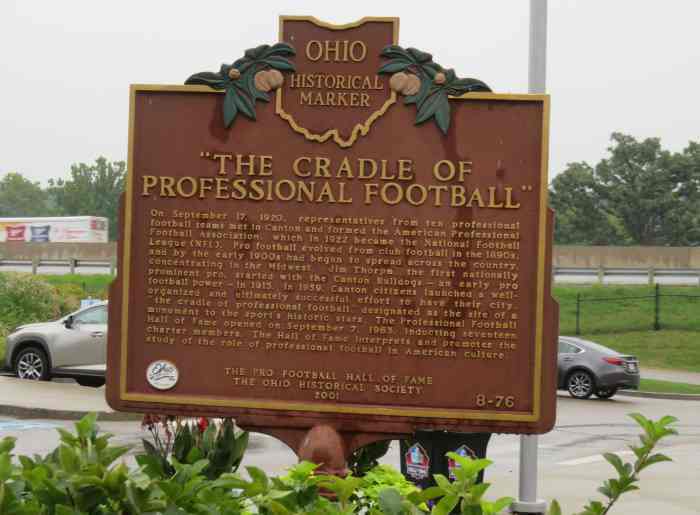 Canton is the birthplace of the National Football League and home to the place that honors it, the Pro Football Hall of Fame. 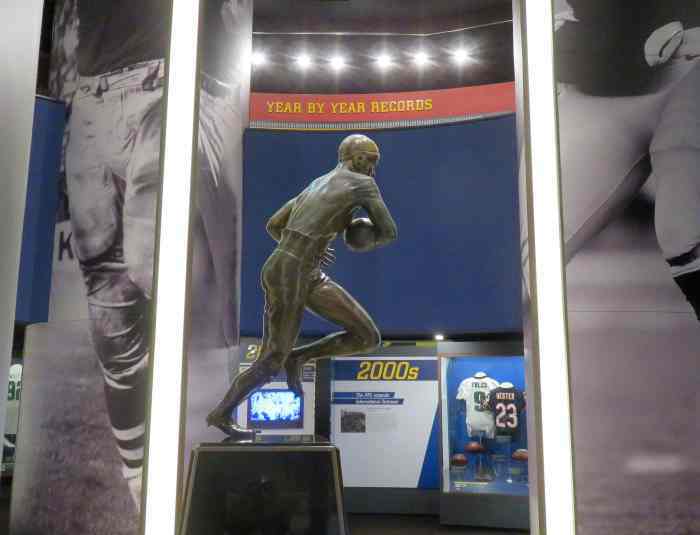 Whether you’re a lifelong fan of football or a youngster just getting into the game, a visit to the Pro Football Hall of Fame is a fun experience that holds jaw-dropping exhibits and activities within. 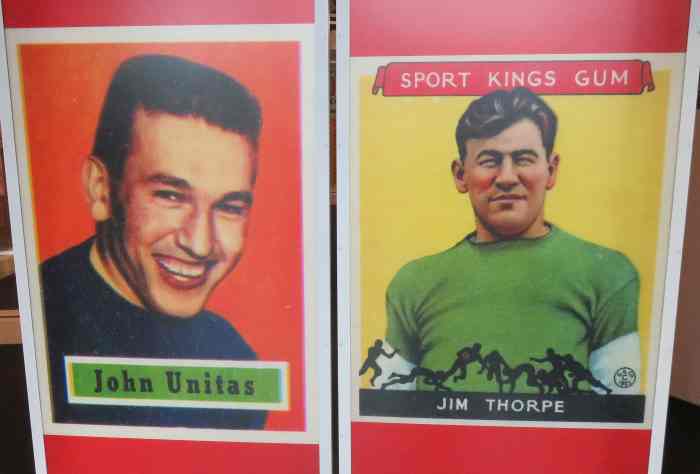 One of the first exhibits you’ll see upon entry to the museum is a massive collection of sports cards that feature the stars of football, including lots of rarities like the Joe Namath rookie card. 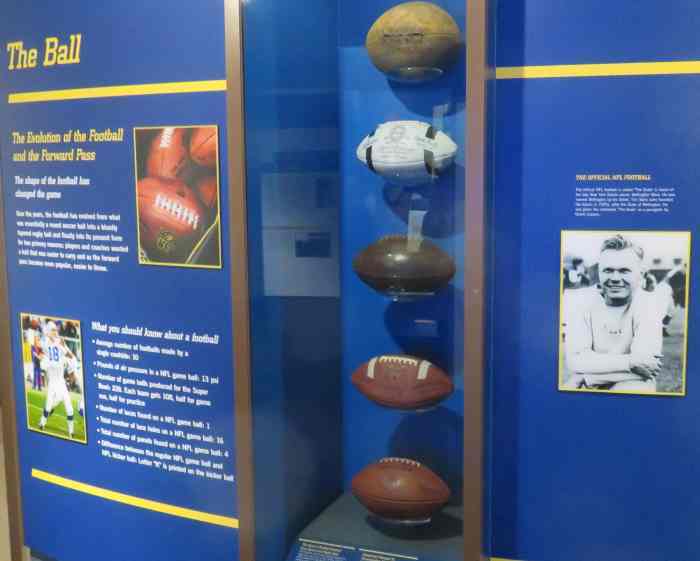 There’s also a display right by the museum’s grand entrance that shows how the design of the football has changed over the years; early balls were clearly not made for a passing game. 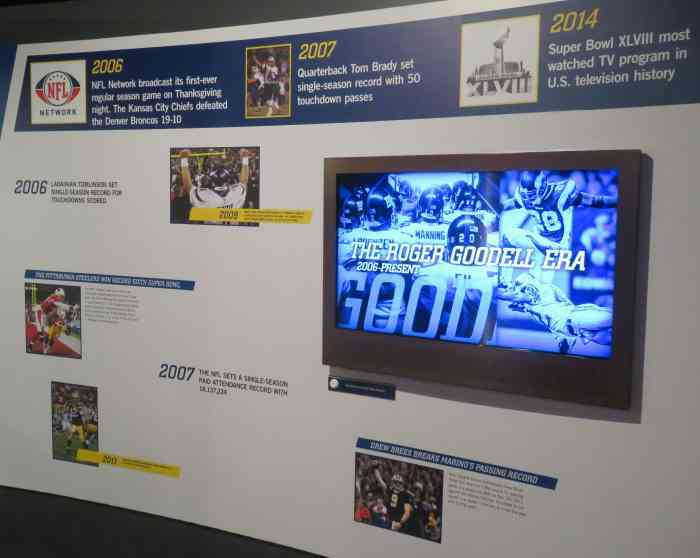 The museum is laid out in chronological order with walls displaying information for each era, with photos, jerseys and gear, television monitors showing film, and lots more used as attention-getting visual aids. As you follow the chronology you’ll come across plenty of interactive exhibits and have a chance to do things like put on a helmet to hear how coaches communicate with players, see how it feels to wear pro shoulder pads, and, through casts made of various players, compare your arm and leg size to theirs. There’s even a chance to see what it’s like being a game official using instant replay. Perhaps the biggest interactive thrill of all is the chance to try on a Super Bowl ring. Other displays of note at the Pro Football Hall of Fame are the Bust Room, where bronze busts of more than 300 players (Hall of Fame inductees all) are on display, and the strategically-placed you-can’t-miss-it bronze statue of the legendary Jim Thome. 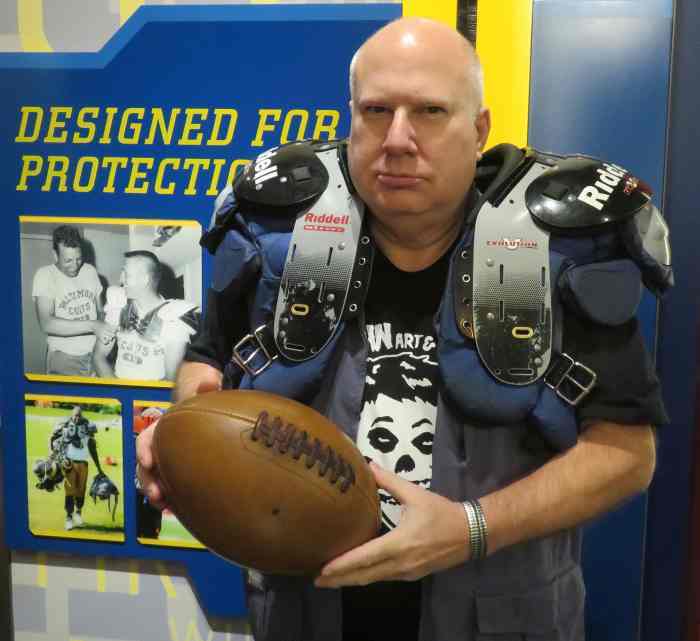 The large museum is packed with all sorts of memorabilia that’ll keep your eyes delighted, and of course there’s information on how the NFL came into being and why that event happened in Canton. Every team past and present has representation, and if you want to learn about the local team from nearby Cleveland, just look for the cute depiction of the pixie-like Brownie, the one-time symbol of the Cleveland Browns. 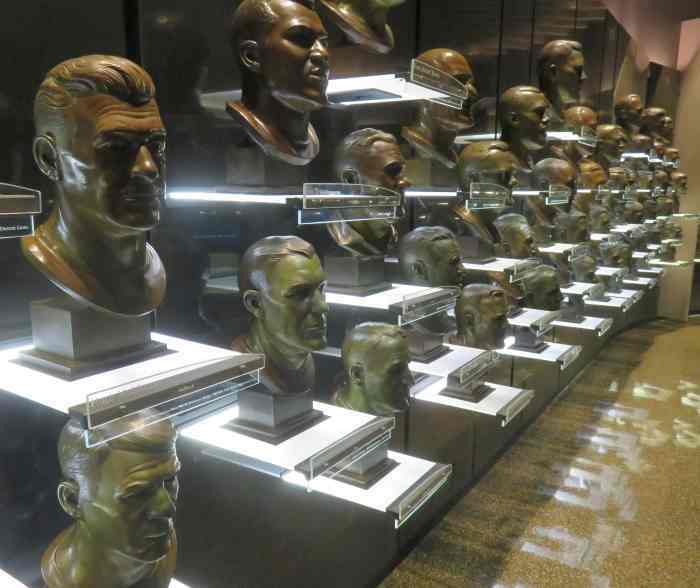 Visitors will choose lots of different aspects of the Pro Football Hall of Fame as their favorite, but many will be thrilled the most by being addressed by Joe Namath. Namath, as a hologram, seems to be real and right in the room at an exhibit entitled A Game for Life, which takes place in a small theater set up to resemble a locker room. The presentation also depicts (with actors) famed late coaches George Halas and Vince Lombardi in hologram form; both give rousing half time speeches. Namath, who “hosts” the presentation, ties everything together with his commentary. 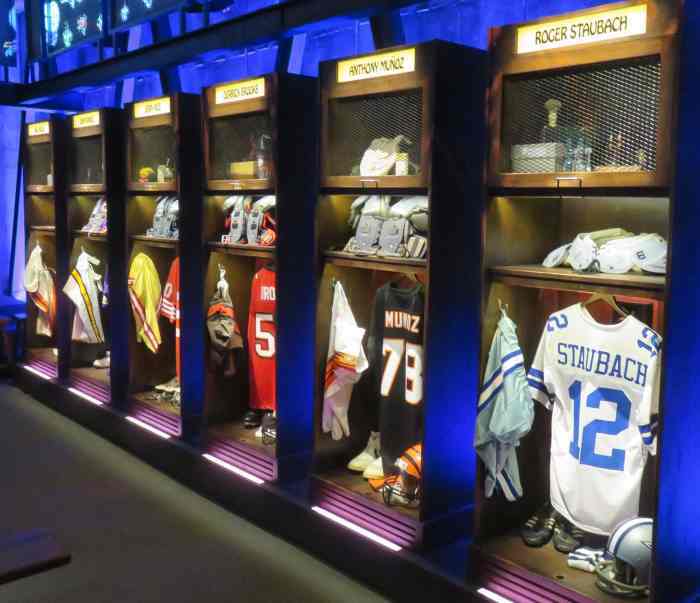 After the visual presentation, fans will have a few minutes to look at the “lockers” in the room, each of which is made up to resemble the locker of a famous player.